All Utricularia are carnivorous and capture small organisms by means of bladder-like traps. Terrestrial species tend to have tiny traps that feed on minute prey such as protozoa and rotifers swimming in water-saturated soil. The traps can range in size from 0.2 mm to 1.2 cm. Aquatic species, such as U. vulgaris (common bladderwort), possess bladders that are usually larger and can feed on more substantial prey such as water fleas (Daphnia), nematodes and even fish fry, mosquito larvae and young tadpoles. Despite their small size, the traps are extremely sophisticated. In the active traps of the aquatic species, prey brush against trigger hairs connected to the trapdoor. The bladder, when “set”, is under negative pressure in relation to its environment so that when the trapdoor is mechanically triggered, the prey, along with the water surrounding it, is sucked into the bladder. Once the bladder is full of water, the door closes again, the whole process taking only ten to fifteen thousandths of a second. 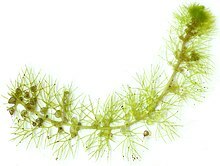 The name bladderwort refers to the bladder-like traps. The aquatic members of the genus have the largest and most obvious bladders, and these were initially thought to be flotation devices before their carnivorous nature was discovered. Approximately 20% of the species are aquatic. Most of these drift freely over the surface of ponds and other still, muddy-bottomed waters and only protrude above the surface when flowering, although a few species are lithophyticand adapted to rapidly moving streams or even waterfalls. The plants are usually found in acidic waters, but they are quite capable of growing in alkaline waters and would very likely do so were it not for the higher level of competition from other plants in such areas. Utricularia vulgaris is an aquatic species and grows into branching rafts with individual stolons up to one metre or longer in ponds and ditches throughout Eurasia. Authorities on the genus, such as botanists Peter Taylor and Francis Ernest Lloyd, agree that the vacuum-driven bladders of Utricularia are the most sophisticated carnivorous trapping mechanism to be found anywhere in the plant kingdom. The bladders are usually shaped similarly to broad beans (though they come in various shapes) and attach to the submerged stolons by slender stalks. The bladder walls are very thin and transparent, but are sufficiently inflexible to maintain the bladder’s shape despite the vacuum created within. The entrance, or ‘mouth’, of the trap is a circular or oval flap whose upper half is joined to the body of the trap by very flexible, yielding cells which form an effective hinge. The door rests on a platform formed by the thickening of the bladder wall immediately underneath. A soft but substantial membrane called the velum stretches in a curve around the middle of this platform, and helps seal the door. A second band of springy cells cross the door just above its lower edge, and provide the flexibility for the bottom of the door to become a bendable ‘lip’ which can make a perfect seal with the velum. Terrestrial species generally have tiny traps (sometimes as small as 0.2 mm) with a broad beak-like structure extending and curving down over the entrance; this forms a passageway to the trapdoor and may help prevent the trapping and ingestion of inorganic particles. Aquatic species tend to have larger bladders (up to 1.2 cm), and the mouth of the trap is usually surrounded not by a beak but by branching antennae, which serve both to guide prey animals to the trap’s entrance and to fend the trap mouth away from larger bodies which might trigger the mechanism needlessly. Epiphytic species have unbranched antennae which curve in front of the mouth and probably serve the same purpose, although it has been observed that they are also capable of holding a pocket of water in front of the mouth by capillary action, and that this assists with the trapping action. As water is pumped out, the bladder’s walls are sucked inwards by the partial vacuum created, and any dissolved material inside the bladder will become more concentrated. The sides of the bladder bend inwards, storing potential energy like a spring. Eventually, no more water can be extracted, and the bladder trap is ‘fully set’ (technically, osmotic pressure rather than physical pressure is the limiting factor). This structural evolution seems highly unlikely to have arisen by chance alone; therefore, many researchers suggest this key adaption in Utricularia allowed for radical morphological evolution of relatively simple trap structures to highly complex and efficient snares. This adaptation may have enhanced the genus’ fitness by increasing its range of prey, rate of capture, and retention of nutrients during prey decomposition. In the 1940s, Francis Ernest Lloyd conducted extensive experiments with carnivorous plants, including Utricularia, and settled many points which had previously been the subject of conjecture. He proved that the mechanism of the trap was purely mechanical by both killing the trigger hairs with iodine and subsequently showing that the response was unaffected, and by demonstrating that the trap could be made ready to spring a second (or third) time immediately after being set off if the bladder’s excretion of water were helped by a gentle squeeze; in other words, the delay of at least fifteen minutes between trap springings is due solely to the time needed to excrete water, and the triggers need no time to recover irritability (unlike the reactive trigger hairs of Venus Flytraps, for example). He produced suitable artificial “prey” for his experiments by stirring albumen (egg white) into hot water and selecting shreds of an appropriate length and thickness. When caught by one end, the strand would gradually be drawn in, sometimes in sudden jumps, and at other times by a slow and continuous motion. Strands of albumen would often be fully ingested in as little as twenty minutes. Mosquito larvae, caught by the tail, would be engulfed bit by bit. A typical example given by Lloyd showed that a larva of a size at the upper limit of what the trap could manage would be ingested stage by stage over the course of about twenty-four hours; but that the head, being rigid, would often prove too large for the mouth of the trap and would remain outside, plugging the door. When this happened, the trap evidently formed an effective seal with the head of the larva as it could still excrete water and become flattened, but it would nevertheless die within about ten days “evidently due to overfeeding”. Increased respiration rates caused by mutated COXI may have caused two additional traits in the Utricularia–Genlisea clade: i) greatly increased rates of nucleotide substitution and ii) a dynamic decrease of genome size, including Utricularia species with some of the smallest haploid angiosperm genomes known. A recent study conducted three cDNA libraries from different organs of U. gibba (~80Mb) as part of a large scale Utricularia nuclear genome sequencing project. They recorded increased nucleotide substitution rates in chloroplast, mitochondrial, and cellular genomes. They also recorded increased levels of DNA repair-associated proteins and reactive oxygen species(ROS)-detox. ROS is a product of cellular metabolism that can potentially cause cellular damage when accumulated in high amounts. Interestingly, they determined the expression of DNA repair and ROS detox was ubiquitous rather than trap-specific. Due to this ubiquitous expression, relative ROS detoxification is expected to be lower in trap structures due to the high respiratory rate caused by trap activations, eventually leading to higher toxic effects and mutagenesis. Mutagenic action of enhanced ROS production may explain both high rates of nucleotide substitution and the dynamic evolution of genome size (via double strand breaks). This genus was considered to have 250 species until Peter Taylor reduced the number to 214 in his exhaustive study The genus Utricularia – a taxonomic monograph, published by Her Majesty’s Stationery Office in 1989. Taylor’s classification is now generally accepted with modifications based on phylogenetic studies (see below). Rutishauser, Rolf; Isler, B. “Developmental Genetics and Morphological Evolution of Flowering Plants, Especially Bladderworts (Utricularia): Fuzzy Arberian Morphology Complements Classical Morphology”. Annals of Botany. 88: 1173–1202. doi:10.1006/anbo.2001.1498. Treat, Mary. 6 March 1875. Plants that eat animals. The Gardeners’ Chronicles, pp. 303-304. Darwin, Charles. 1875. Insectivorous Plants. New York.